When the heat of the day has passed the covered porches of the Beacon House Inn are a lovely spot to enjoy a cocktail before heading out for the evening. Pull up a rocking chair and listen to the waves while sipping on a cold beverage. One of our favorite summertime “porch-sippin” libations is the Classic Mojito straight from Havana Cuba. 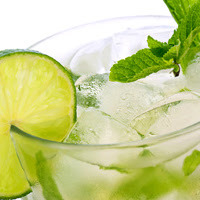 The mojito is a crisp and refreshing accompaniment to a hot summer night. Here is a copy of the original recipe created at La Bodeguita del Medio in Havana, Cuba and enjoyed by none other than Ernest Hemingway himself. We hope you like it! Come on down and join us for Mojitos on the porch at the Beacon House Inn! We look forward to seeing you! This entry was posted in Beacon house inn, cocktails by admin. Bookmark the permalink.